John Francis Latham, a native of New Orleans, passed away peacefully on May 9, 2012 at the age of 91. He was the beloved husband of the late Audrey Daniel Latham for over 59 years. He is survived by his children: David M. Latham (Jeanine), Susan L. Andres (Paul), Nancy L. Collens (Tom), William B. Latham, and Mark D. Latham (Raye); and was preceded in death by his son, John F. Latham, Jr. He is also survived by his loving grandchildren: Lauren and Michael Latham, Sarah and Kathryn Andres, Connie Wildhaber (James), Jennifer Latham, Thomas (Mandy) and John Collens, and Bradley, Joshua, Matthew and Margaret Latham; his great-grandchildren: Stacey and Marisa Wildhaber, Dillon Delaune and Tommy Collens; his sisters-in-law: Lorraine Daniel, Patsy Dreuil, and Mary Carriere Daniel, O.P. and many nieces and nephews. Son of the late Clancy Abernathy Latham and Mildred Sporl Latham John was preceded in death by his brother, Clancy Abernathy Latham, Jr. John was a life-long resident of New Orleans and graduated from Fortier High School. He earned a Bachelor of Arts and LLB from Tulane University and served in the Naval Officers’ Training Corp at Tulane University. 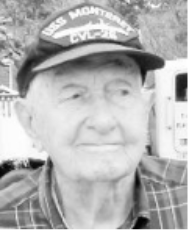 He was commissioned an Ensign, in USNR in 1942 and saw active duty in the U.S. Navy as a Deck and Gunnery Officer on the USS Cincinnati and USS Monterey. Following the War, he practiced as an Average Adjuster for over 45 years. He was a member of the New Orleans Bar Association and the Louisiana State Bar Association. He was active in the Dads’ Clubs at Holy Name of Jesus and Mercy Academy. He was a member of the Dixie Twirlers, Lakeside, and Pelican Squares dance clubs. Relatives and friends of the family are invited to attend services at 12 noon on Friday, May 11, 2012 at Lake Lawn Metairie Funeral Home, 5100 Pontchartrain Blvd. in New Orleans, Louisiana. Visitation on Friday, May 11 from 10:00 a.m. until the services at Lake Lawn. Interment will follow at Metairie Cemetery. The family wishes to thank the wonderful and caring staffs of Chateau de Notre Dame and Ochsner Medical Center. Donations to the Dominican Sisters of Peace (7320 St. Charles Ave., New Orleans, LA 70118) are preferred. To view and sign the family guest book, please visit www.lakelawnmetairie.com.